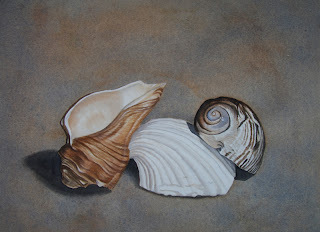 This is the latest in a series of paintings of still life seashells in watercolor that I am working on. I set up the shells in my studio then take several photos from all different angles. Once I find a photo I am happy with I transfer a sketch of the photo to my watercolor paper and start building up the layers of the background varying the colors depending on the colors in the shells. I then build up the shells in layers using similar colors that are used in the background to provide harmony yet still allow contrast between the shells and the sand. The shells are almost complete in this painting and then I will darken areas of the background to provide a bit more contrast.